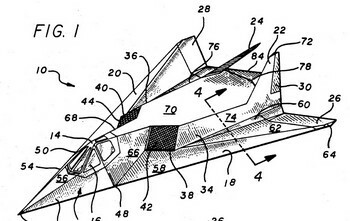 Blog reader Avi Solomon responded to the post on Northrup's Flying Wing by forwarding me the patent number of the Stealth Fighter, the F117-A, U.S. Patent number 5,250,950.
a plurality of surfaces defining the exterior of said fuselage and wings, said surfaces consisting of a series of facets. That is a pretty broad claim, and indicates to me that there just wasn't anything like it in previous patents. The designers knew the concept would work when they mounted a scale model in a radar range test area, to see if it could really be invisible to radar. The radar operators turned on their system, and intently looked for the plane, adjusting their controls, since they knew it was there. At first they had no contact, but then, the radar operators shouted out "target acquired! ", thinking they had proven the effectiveness of their radar systems, and that nothing was invisible to radar. When they looked up, they realized they were detecting a bird sitting on the model, and when the bird flew off, the model was again invisible to their radar.